It's killing unfathomable numbers of trees all across the region. I had noticed in your other photos that there were a lot of dead pine trees, and I wondered what was causing it. Now I know. Shannon…I noticed the same thing and thought it was odd for evergreens. wow. I saw the dead looking trees in your other shots but didn’t know they were from this. I have beetles investing my trees here by beetles but not these kind that I know of. They can be so damaging and they do burrow their way into the bark. I am going to have to cut my snowball bush down this winter to try to kill the beetles out of it. At least that’s what I was told to try. I hope it works and my bush comes back eventually. These trees out west there, such damage to such beautiful lands. Catastrophic is what it sounds like from the link you gave Matt. I thought maybe drought….but I guess not. Invasive species. wow…..Beetle might win. The mountain pine beetle is a native species. It is thought that because of fire suppression and warmer winters, it has become so devestating. Agreed Paul – The Yellowstone fires of 1988 helped control them in that country. Outside of that – not much that can be done. In the Libby, MT area in the late 1980’s early 1990’s there a was a big problem with Pine Bark Beetles. That problem got contained by a massive logging effort which provide many benefits. 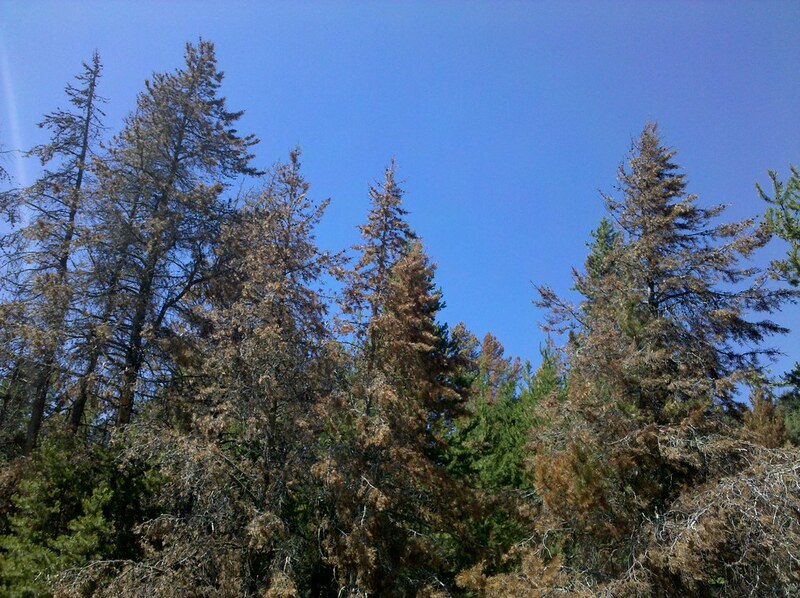 1. saveed many other areas from the Pine Bark Beetle. 2. Provided thousands of good paying jobs on Logging sites and Lumber Mills. 3. Reduced fuel for Forest fires. 4. Provided US grown and processed Lumber to the construction industry. Today we do not have enough Loggers or Mills left in this country to deal with this problem as result huge amounts of Timber will simply rot and burn. Then when we need lumber we will import even more from Canada. What a shame to see this valuable crop go to waste. Matt – One of my cousins down in Conner, MT owns a heli-logging company and a lot of his business right now is trying to remove these deseased trees as fast as he can when the forest serivice finds a large outbreak. Some folks have seen him on the History Channel – Ryan Connor of R & R Connor and I doubt if there is enough is poison to accomplish the eradication. Wait until you make it to Crater Lake, OR, if you get by there, to see the devastation caused by a foreign beetle that came over from Europe in the late 1800’s. Who loves ya’!!! In Alaska we have spruce beetles that are killing millions of acres of our beautiful trees. In our travels around the US and Canada we have seen first hand the devastation caused by these bugs- from Alaska to Mexico. Trees everywhere are are dying from one cause or another which makes me want to cry since I have lived all my life in forests like these. Matts trip and comments have been very informative. I have enjoyed it all. We’ve got destructive beetles here, too, in upstate New York. I was wondering if you would mention the “problem” when you encountered it. I thought of forewarning you when you were back on the treeless plains but… you keep your blog upbeat and this is certainly a downer. Fire suppression, mild winters, monoculture, and mass plantings of same aged saplings create the ideal haven for destructive beetles. It is indeed a bummer. I believe Montana’s invasive is the Japanese pine beetle…Many of hour regions pine stands have been wiped out, Making our Fire season already bad. The lake down the road from here has already suffered 2 fires over 700 Acres with one just now being contained. These beetles are making Great Fuel for rampant fires…. Sigh. It just makes me sad. My favorite part of this area are all of the trees. Darn beetles need to just get out! 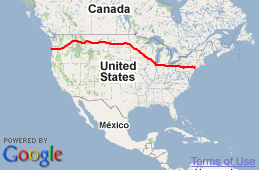 They are having problems with this in the Black Hills of SD. Part of it comes from having so many trees that aren’t as healthy as they should be. In earlier days, fires and then the forest services kept the trees thinned out but so many conservationists yell so loud that the forest service people seem to be afraid to cut any trees. The thing that some conservationists don’t understand is that if you don’t manage the forests properly, you cause more problems than if you cut some of the trees so the rest stay healthier. Same with the anti-hunting people — if the herds aren’t properly culled, the deer, bison, or whatever, over-populate and then more of them go hungry and get sick, etc. Resource management is really important in some of these areas. Sad to see, and we may not live to see it – but the stronger trees will survive or evolve some kind of defense mechanism. And then of course the stronger beetles will survive, it’s a never ending cycle of natural selection. Jim you are so right – It was amazing the press written about the Yellowstone burn and Nature just recovers without our “help”. Also “recent”, check out the Mt. St. Helen’s area recovery, after the blast. I realize the “disasters” are immediately felt by those dealing with them real-time. I’ve just learned a bit to go with the flow. This too shall pass. Do what you can to recover, enjoy your life (hills and valleys) and move on. Please realize, that I’ve been through a few natural disasters (flooding, hurricanes, tornadoes – all with much damage – esp. the flooding, my Mom’s house in Elba flooded 3 times). I don’t speak lightly or flippantly. That’s not the “beetle” kind of disaster, but Mother Earth/Nature will recover. It just may not be in our lifetime……. Candice in Alabama, making lemonade out of lemons, when possible!